The ST-7000 integrates power and ultimate connectivity into a very small footprint to optimize selling space. Its robust and versatile design makes the ST-7000 the POS System of choice for discerning retailers. Needs just a single power outlet to run POS and all peripherals. 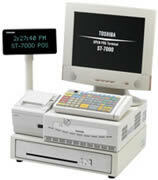 The ST-7000 is a POS System Terminal that utilizes the latest technology. The high-performance POS System Terminal offers a real advantage to all types of retail outlets in the increasingly competitive marketplace. Still another new feature is "Powered USB," which makes it possible to connect a range of peripheral devices to the unit. The optional dual-display feature attractively displays commercial messages and images, as well as store notices and event information for shoppers. This page is part of GeneralManual.Com Network Toshiba TEC ST-7000 Modular POS Terminal User Manual.